New book, 128 pages. The SM Series books will follow a new standardized size format from RSP, which is a smaller and lighter scaled-down version of the famous TANKART books. The new size is 6.5" x 7.5", traditional perfect-bound. Each book is wrapped with a special linen stock that is completely unique to the hobby world for a softcover publication, and the interior paper is an eco-friendly 30% recycled stock that gives these new books a great tactile feeling. A core premise of the new series is to explore and redefine artistic and creative finishes for each subject. 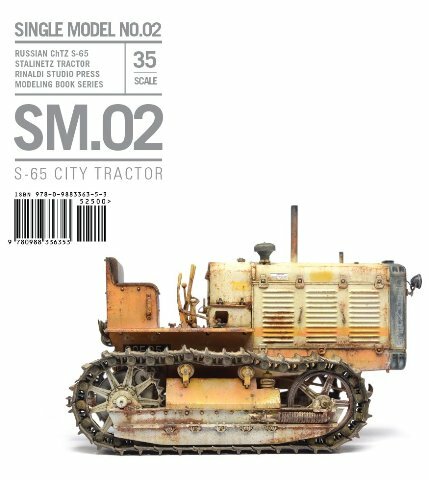 SM.02 S-65 Tractor features a civilian based project created from the excellent 1/35 Trumpeter Stalinetz S.65 Russian Army tractor kit, with a finish that is designed to explore other realms of possibilities. This model will illustrate how a potential city owned Municipal-based service might have utilized this once military vehicle, and is influenced by the many worn out tractors seen in the Pacific Northwest.